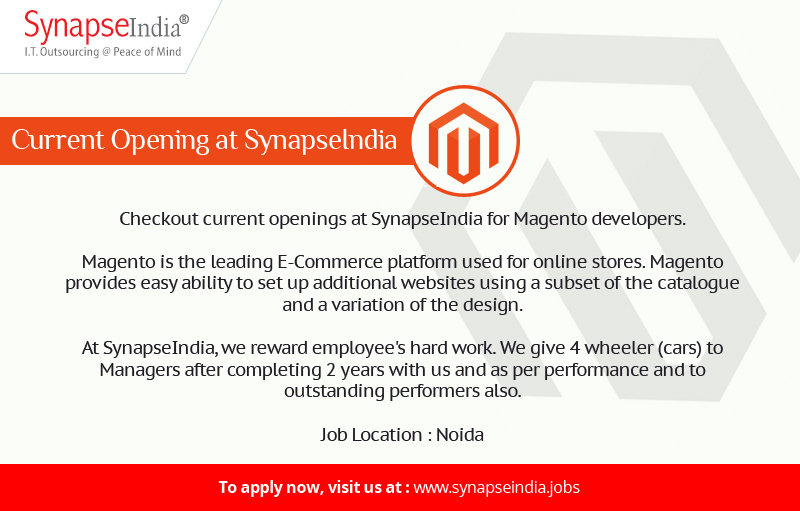 Apply for SynapseIndia current openings for the profile of Magento developers. Magento is the leading E-Commerce platform used for online stores. Magento provides easy ability to set up additional websites using a subset of the catalogue and a variation of the design. Shamit Khemka founded SynapseIndia in the year 2000. We have a team of experienced Magento Developers that have helped the company to build many E- Commerce websites. At SynapseIndia, we reward employee's hard work. We give 4 wheeler (cars) to Managers after completing 2 years with us and as per performance and to outstanding performers also.